“…we have agreed to form an association, to be called ‘the society of United Irishmen’. First, Resolved, That the weight of English influence in the Government of this country is so great, as to require a cordial union among ALL THE PEOPLE OF IRELAND, to maintain the balance which is essential to the preservation of our liberties, and the extension of our commerce. Second, That the sole constitutional mode by which this influence can be opposed, is by a complete and radical reform of the representation of people in Parliament. Third, That no reform is praticable, efficacious, or just, which shall not include Irishmen of every religious persuasion. 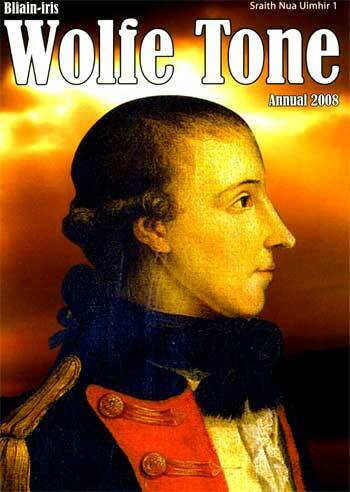 Theobald Wolfe Tone was born in Dublin in 1763. The young Tone often spent time in the public galleries of the Irish House of Commons. He quickly realised the impotence of that assembly, and how its sole purpose was to serve the interests of England. Three quarters of his countrymen were precluded from representation in this “parliament” by virtue of religion. The liberal, tolerant Tone realised that the only real future for the people of Ireland was in the separation of the two countries. From his frequent visits to the Irish parliament, Tone became acquainted with the like-minded Thomas Russell. These were the heady days of the French Revolution, when the doctrine of “Liberty, Equality, and Fraternity” seemed a solution for Ireland’s ills too. “An Argument on Behalf of the Catholics of Ireland”. This urged Protestants and Catholics to join together, in mutual respect and esteem, to fight for the cause of Irish independance. This had a great effect on the many liberals, particularly in Belfast. With Henry Joy McCracken and Samuel Neilson, Tone founded the United Irishmen in that city in 1791. It held its first public meeting on 18 October. Returning to Dublin, Tone established there, a few weeks later, another branch of the United Irishmen with James ‘Napper’ Tandy. When war was declared between France and England in 1793, the United Irishmen were suspected of being in league with the French. Tone fled with his family to America. From there he sailed for France in 1796. In Paris he pleaded Ireland’s cause with the French, urging them to send an invasion fleet to Ireland. This ill fated fleet under Hoche, with Tone aboard along with 15,000 men, was scattered and unable to effect a landing in December 1796 in Bantry Bay, due to storms. Tone managed to persuade the French to send a further expedition under General Humbert with 1,000 men. 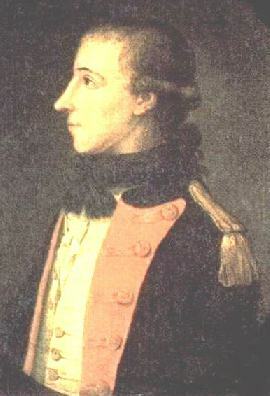 Wolfe Tone was one of the first to recognise a separate Irish nationality, common to all on the Island. He is considered by some as the Father of Irish Republicanism. This page is a salute to him, and his generous, tolerant vision of a future Ireland, where we can all live in harmony in this land that we all love so dearly. His vision is still as valid today as it was in 1798.